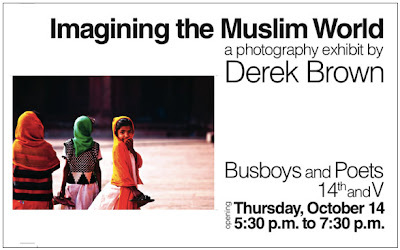 Travel photographer Derek Brown (formerly of NYC and now DC-based) and USAID EFM will have a photography exhibit opening up this Thursday at Busboys and Poets. Derek Brown completed a project titled “Journey to the Muslim World,” in 2009. He took around 40,000 photographs in 30 countries with large Muslim populations throughout his project. His journey started in April 2008 in India, and took him to countries such as Syria, Iran, Pakistan, Indonesia, Egypt, Bosnia and Herzegovina, Senegal, Palestine, Kazakhstan, Mali, Turkey, Spain, Morocco, Mauritania, Bangladesh and others. The exhibit photos are drawn from his 14 months of travel throughout the Muslim world, wrapping up in 2009. The photographer says it's his part of the effort to draw attention to how extremely diverse the Muslim world is. The exhibit was inspired by all of this noise and nonsense coming out of lower Manhattan (where he lived for about 14 years before very recently moving to DC). Derek says that "it might be politically expedient to place all Muslims in a very small package marked "DANGER, EXPLOSIVE" but it could not be less honest or accurate." If you are in the DC area, stop by and visit his exhibit this Thursday at Busboys and Poets. You can also visit his website here and Facebook page here. Some of his fascinating and impressive photo collections are here.